Thomson Reuters - the multinational media and information firm that operates in more than 100 countries, and has more than 60,000 employees around the world - has selected The "World's most influential scientific minds 2014". They have listed some 3,200 researchers who published the greatest number of highly cited papers in one of 21 broad fields. These highly cited researchers were determined by analyzing at citation data over the last 11 years to identify those who published the highest-impact work (2002—2012 and 2012—2013). These individuals are influencing the future direction of their fields, and of the world. 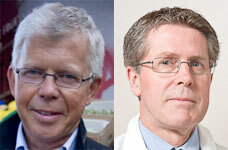 Seven Norwegian scientists are on the list, and of these two researchers represent Oslo University Hospital. These are Rune Blomhoff from the Department of Clinical Service at the Divsion of Cancer, Surgery and Transplantation and Sverre Kjeldsen from the Department of Cardiology, at the Medical Clinic.